Lamb shoulder is lamb primal cut located between the neck, rib, and breast of lamb that is an exceptional source of carotene making it great especially when on a diet. It is also high in zinc. 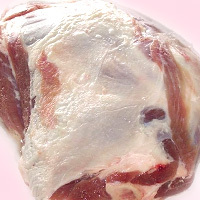 It is a tender meat cut into chops or used to makes lamb dishes such as braised lamb shoulder. The calories in Lamb Shoulder per 100g(1cut) is 233 calories. Lamb Shoulder is calculated to be 233Cal per 100 grams making 80Cal equivalent to 34.33g with 17.1g of mostly fat、17.1g of protein、0.1g of carbohydrates in 100g while being rich in vitamins and minerals such as Vitamin B12 and Zinc.